We are part of a Comprehensive Sleep Program with Board certified Sleep Specialist, Dr Ismail evaluating and treating with interpretation of all sleep studies and working with a team of Sleep Dentist, ENT specialist, Neurologist and a Psychiatrist to manage every aspect and full spectrum of Sleep Disorders and all available treatment options. If any of the following is true, patient should have a Formal Sleep Study in our Sleep Lab, unless patient cannot or refuses it. 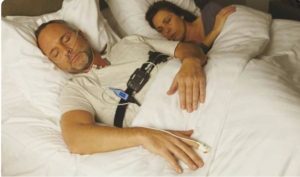 Lack of Mobility or dexterity to use portable monitoring equipment safely at home. Please watch instructional Video on: How to use home sleep testing device.